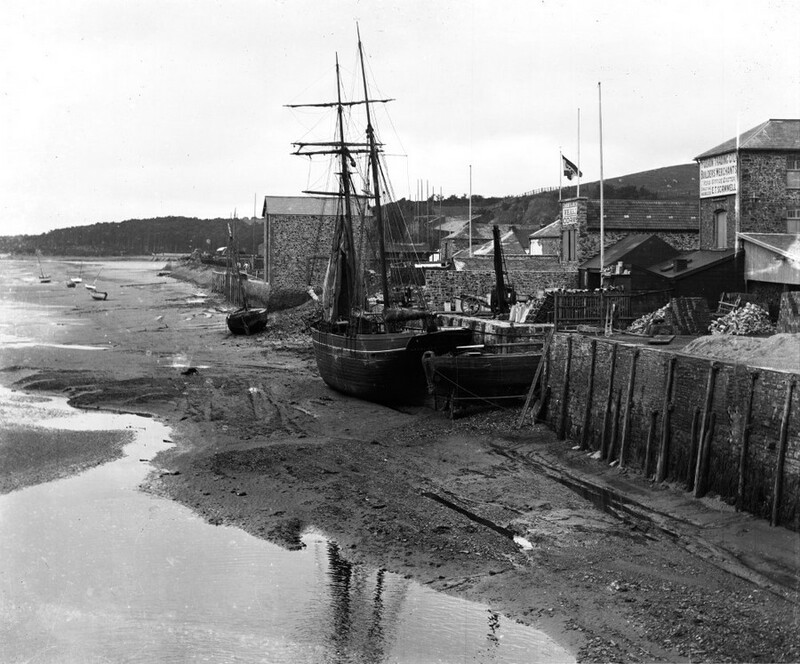 In the background may be seen, L to R, Waters’ Shipyard, the chute of Bideford Anthracite Mining Co.’s gantry (used to load anthracite directly onto vessels) and stores on Clarence Wharf (some of which were used for storing manures). 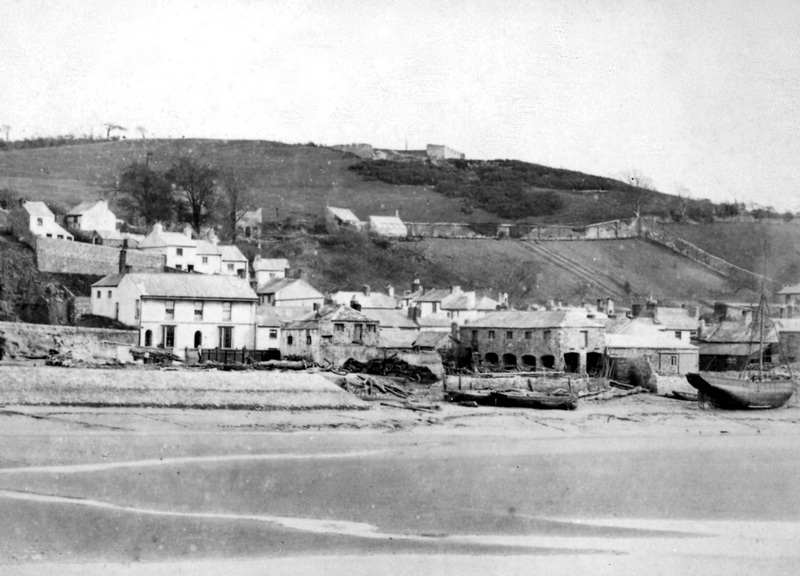 On the hillside behind is vinegar hill, rather more densely populated in those days, before railway extension took its toll of the houses. 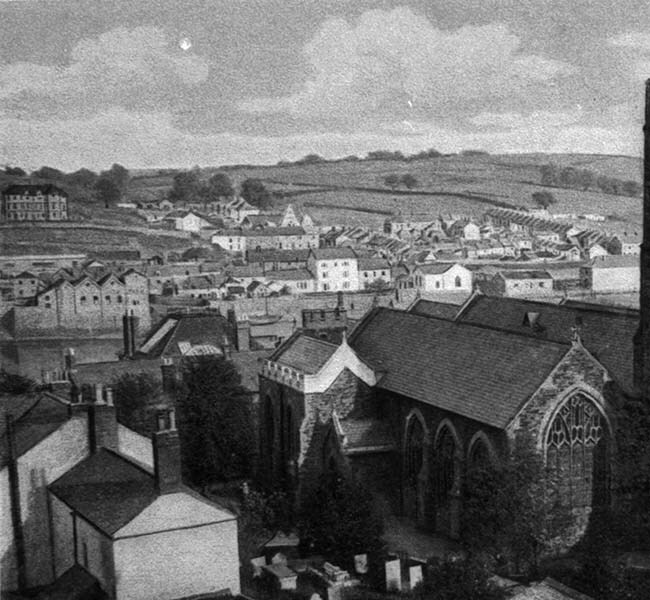 This detail is from a picture believed to be one of Thomas Tedrake’s series of six photographic studies of Bideford, published c. 1863 they were some of the earliest photographs of Bideford. 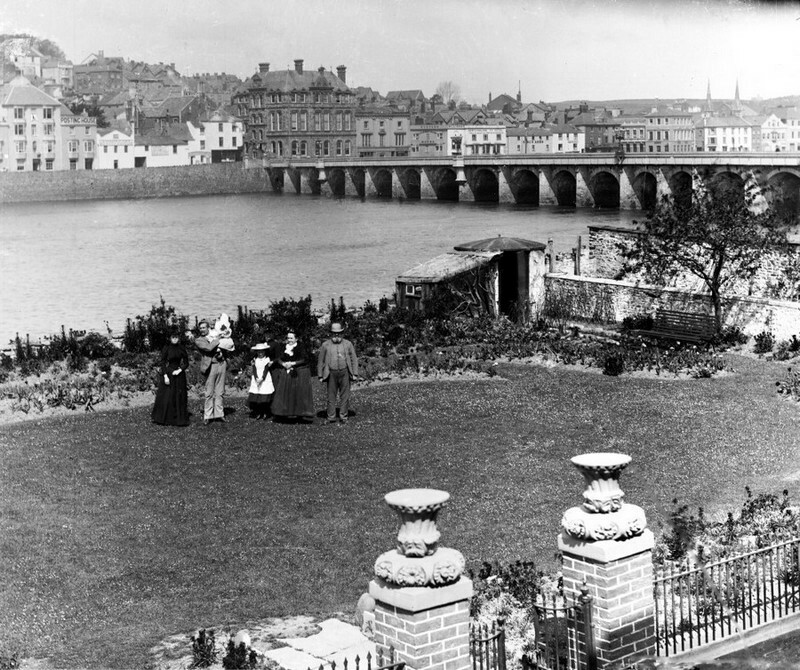 The stone bridge parapet seen here was replaced with an iron one when the bridge was widened in 1864. Our ref. WOTW0003c1; Photographer Thomas Tedrake? 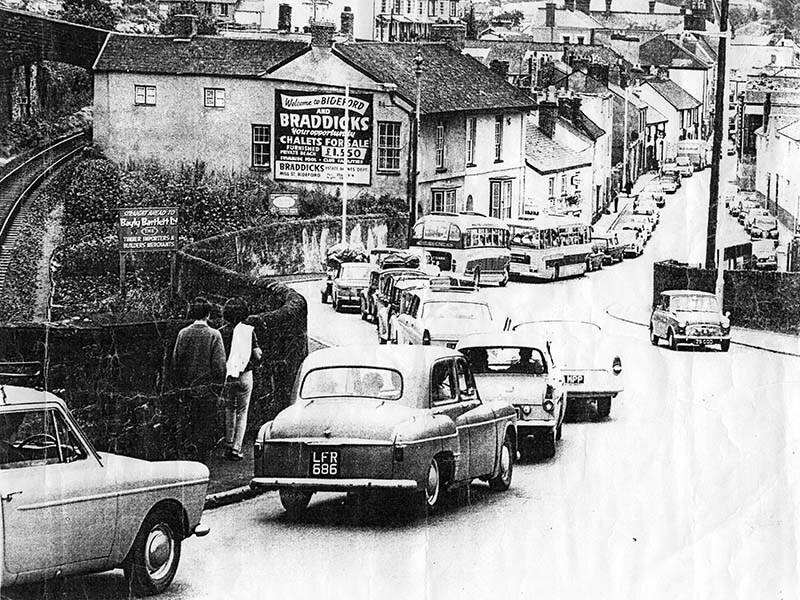 ; detail from a physical copy held by Bideford Library; used courtesy of Bideford Library. Last updated 5 Jan 2019 by R. I. Kirby. 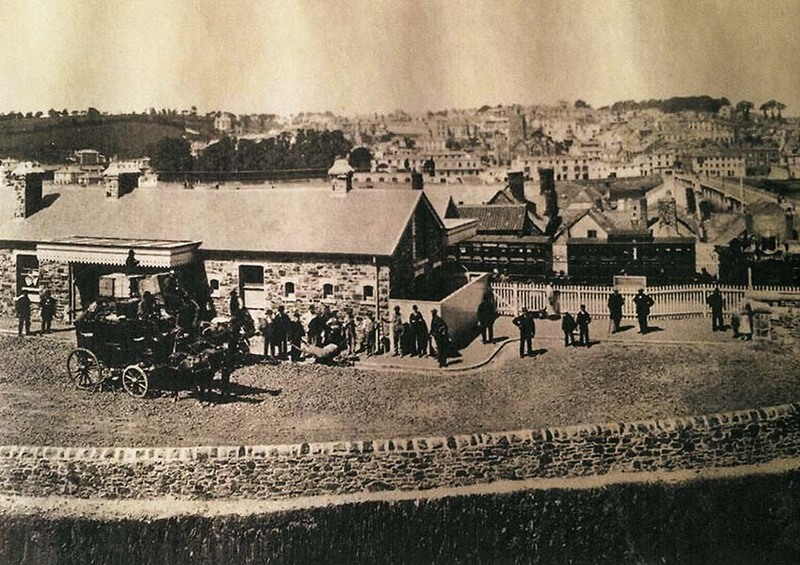 John Johnson’s shipyard on Barnstaple Street, c. 1863. 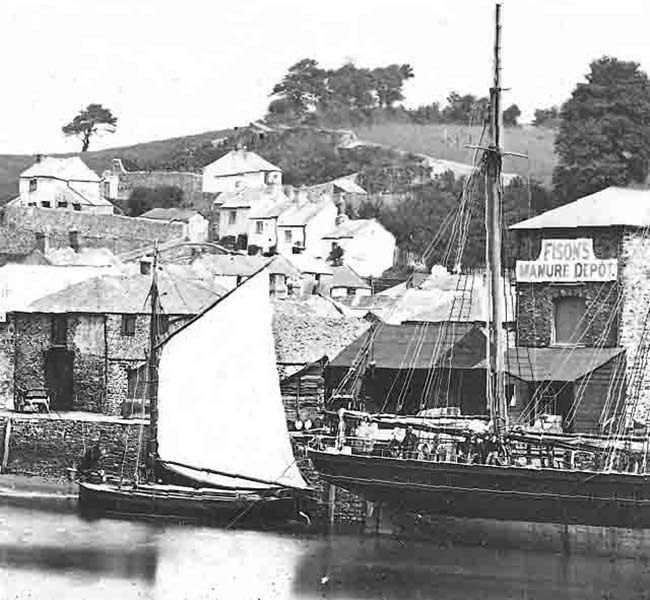 Two generations of the Johnson family, Robert then his son John, managed this shipyard, which claimed to be one of the oldest such establishments in Devon. Evidence of significant shipwright activity on Barnstaple Street dates back to the time of Henry VIII and this yard is one of two, on Barnstaple Street, shown on a plan from c. 1717. Under Robert Johnson the yard could produce two vessel simultaneously, but John increased its capacity to three. 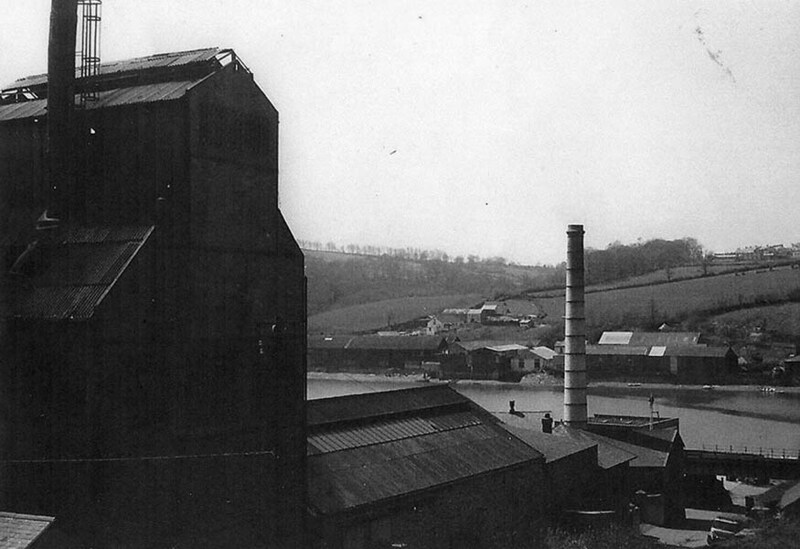 On the hillside, at top left, is the engine house of the Bideford Anthracite Mining Co., which was still in operation at this point. 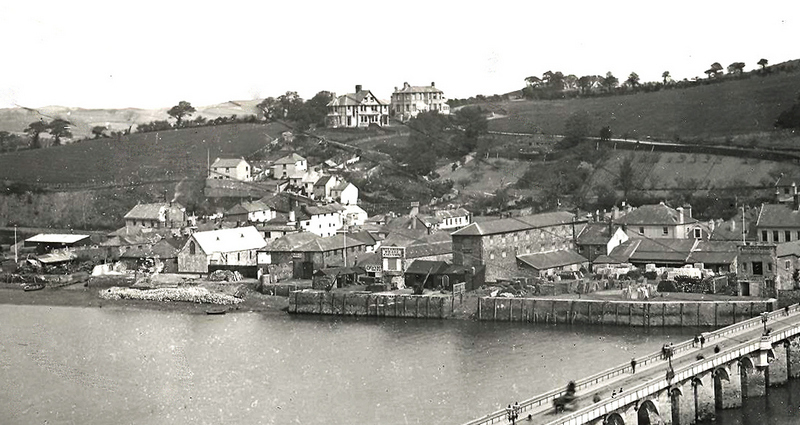 Fulford’s stores and Baker’s Brunswick Wharf, c.1915. 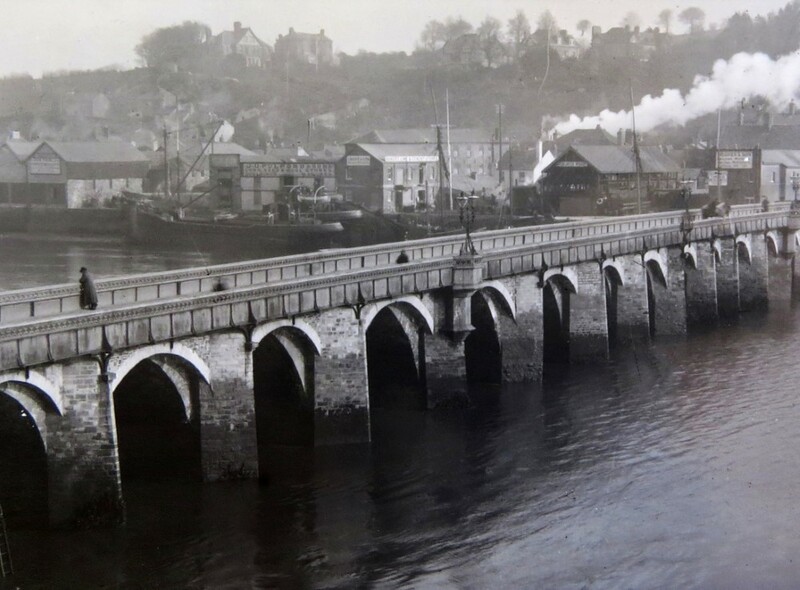 At this point the bridge still has the iron railings, installed when it was widened in 1864 and probably already there by 1868, when the G. A. Preston veered into the bridge as she was being launched from Johnson’s shipyard. 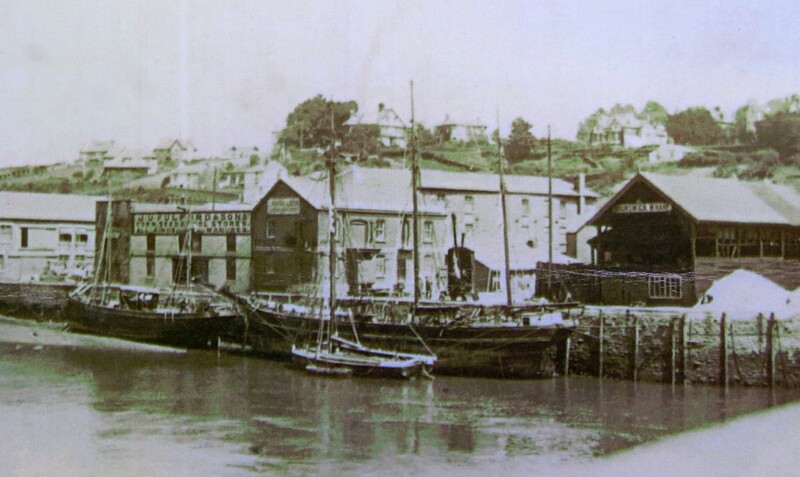 Behind can be seen J. U. Fulford’s stores, at Queens Wharf, with two coasters moored alongside. 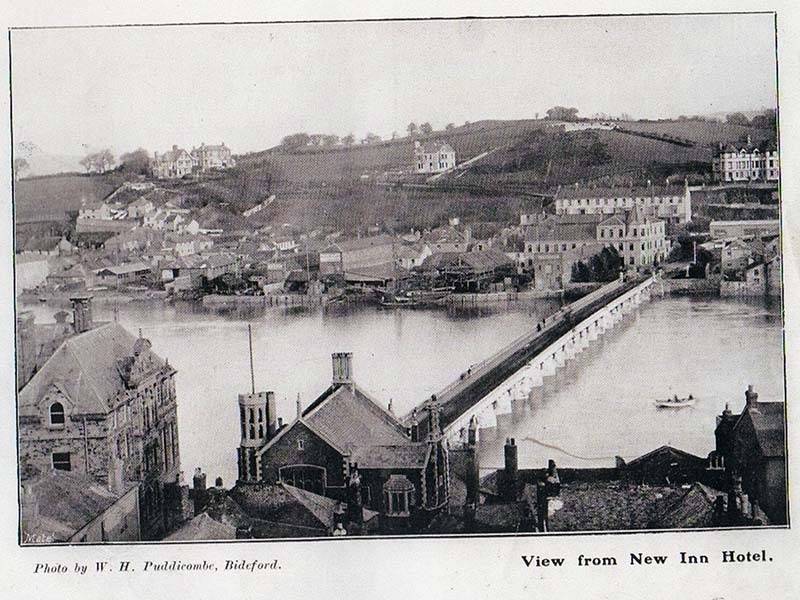 Fulford moved to Queens Wharf in 1909, after being, for a while, based on Clarence Wharf. To the right of this, on Brunswick Wharf, are Baker’s cement and timber stores (beneath the plume of smoke). 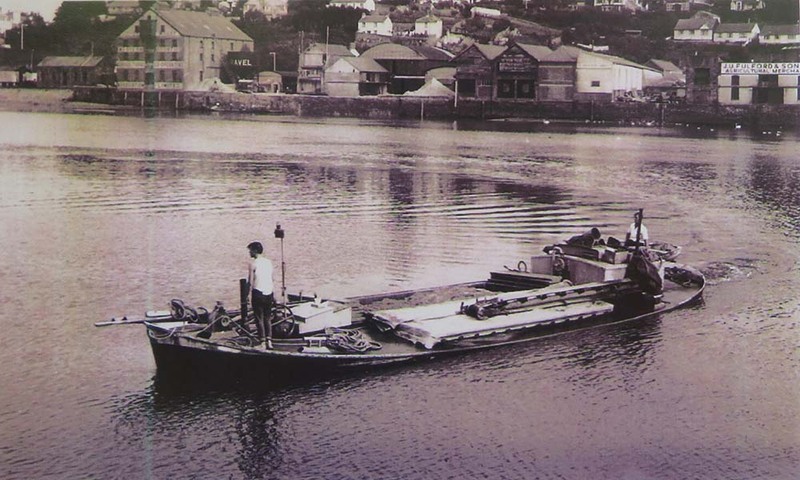 These rocket barges (known colloquially as “rocket ships,” but correctly designated as Landing Craft Tank (Rocket) Mk 3, or LCT(R)3) were designed to support the D-day landings. 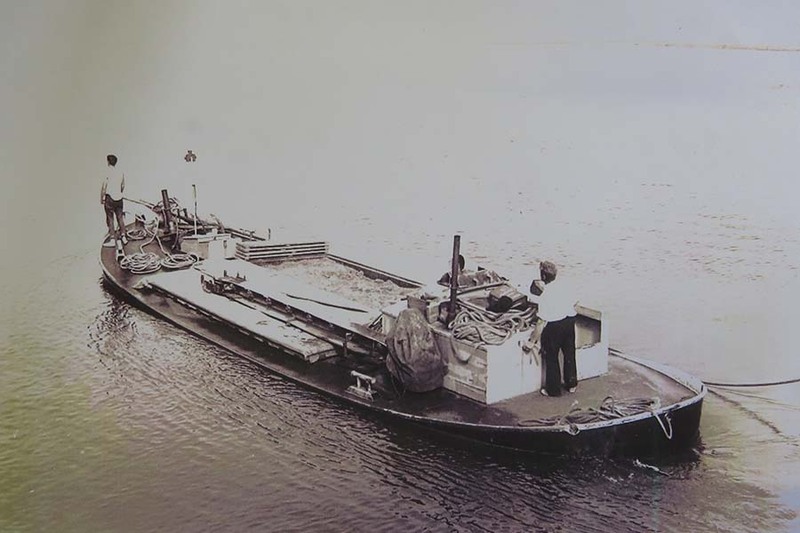 Based on a landing craft designed for carrying tanks, the deck was instead fitted with batteries of “beach rockets.” Each vessel could launch a salvo of up to 1,064 rockets, depositing about 17 tons of explosive over an area of 685 by 145 m, from a two mile range. After reloading once the launchers were jettisoned and the vessels would then serve as ferries. The nearer vessel is the American LCTR 425. The American LCT(R)s were based at US Navy European ‘Base II’, Roseneath, Argyll and Bute, Scotland. 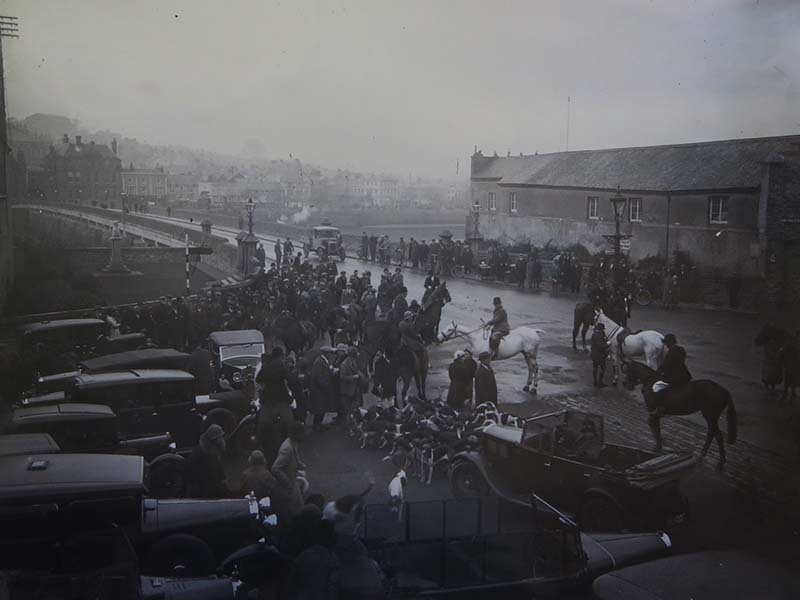 Histories of LCT(R) operations suggest that LCTR 425 was only briefly in the Torridge estuary, as part of a convoy (comprising two LCFs, three LCTRs, and three LCGs) that, having left Roseath, on 20 Mar 1944, arrived at their new base in Plymouth, on 4 April 1944, having called at Appledore en-route. 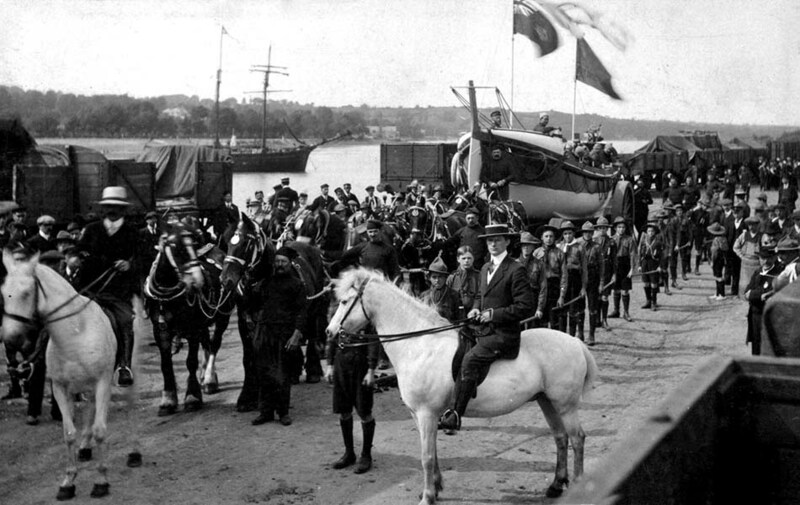 From Plymouth they then took part in training in South Devon, before sailing for the coast of France. On close inspection, the wagons appear to contain planks of wood, a regular commodity handled at Railway Wharf. Our ref. 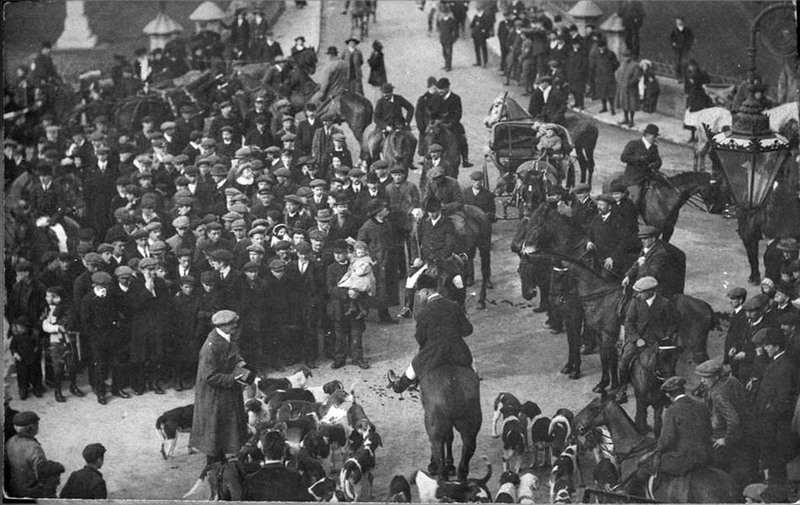 WOTW0004; Photographer unknown; © unknown; detail from a physical copy held by D. Barnes; used courtesy of D. Barnes. Last updated 5 Jan 2019 by R. I. Kirby. 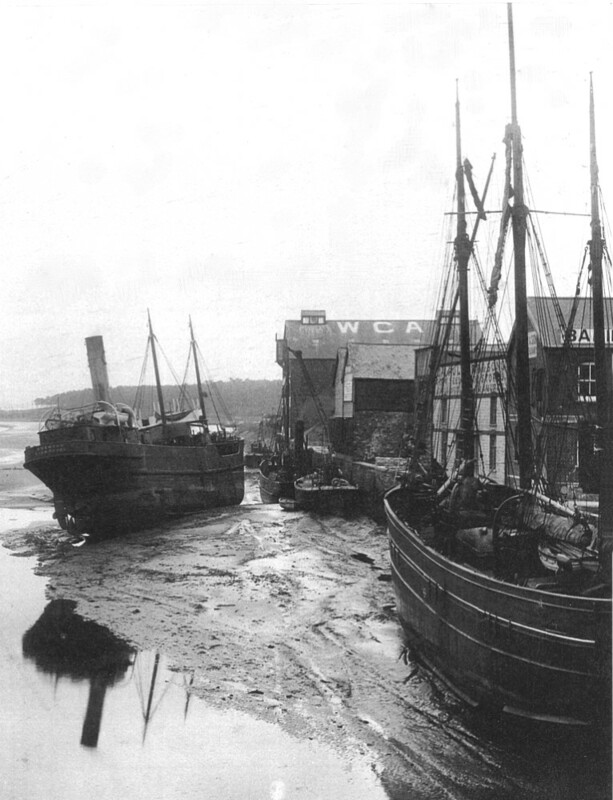 An unidentified schooner discharging a load at Brunswick Wharf with the help of the wharf’s mobile crane. To the left is J. U. Fulford’s establishment, with its banner sign declaring that it was a “corn, seed & tool store” that carried “all kinds manures.” Through a series of acquisitions and mergers, Fulford, as Fulford Trump, would go on to become a major national agribusiness, until themselves acquired. Our ref. 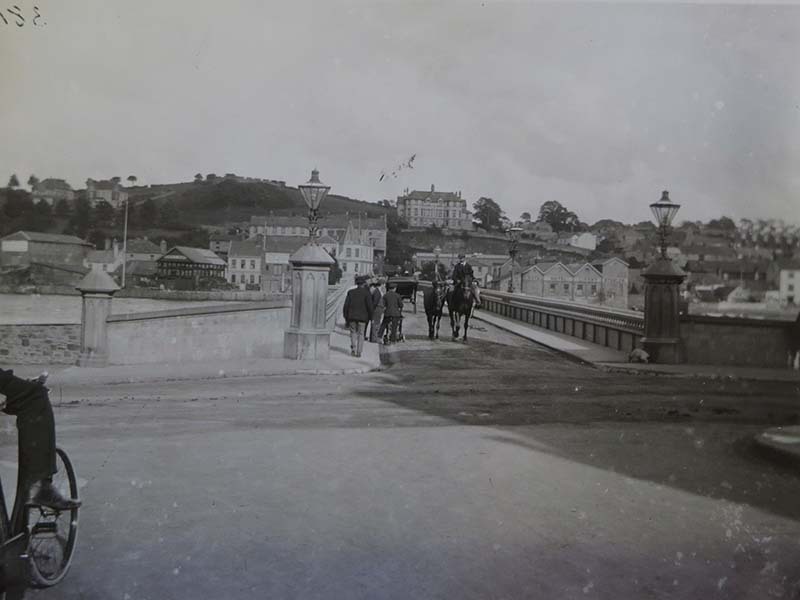 WOTW0006m1c1; Photographer unknown; © unknown; detail from a physical copy held by Bideford Library; used courtesy of Bideford Library. Last updated 28 Jan 2019 by R. I. Kirby. Cutting up the Tetty Boat, 1936. 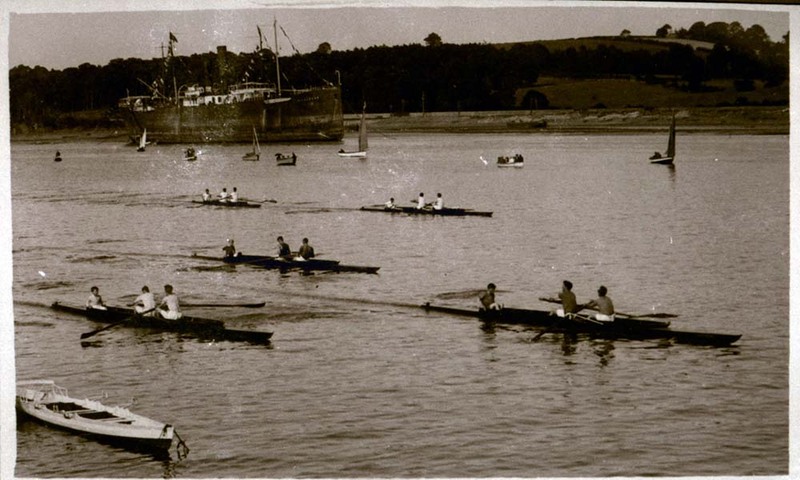 The Tetty Boat, one of Bideford’s river-barges plied the local waters for over a hundred years, worked first by Bob Kivell (‘old Bob of all’) and subsequently, single handedly, by his son Tom (‘Royal’ Kivell). She was finally broken up in 1936, on the eastern shore, upstream of the bridge. 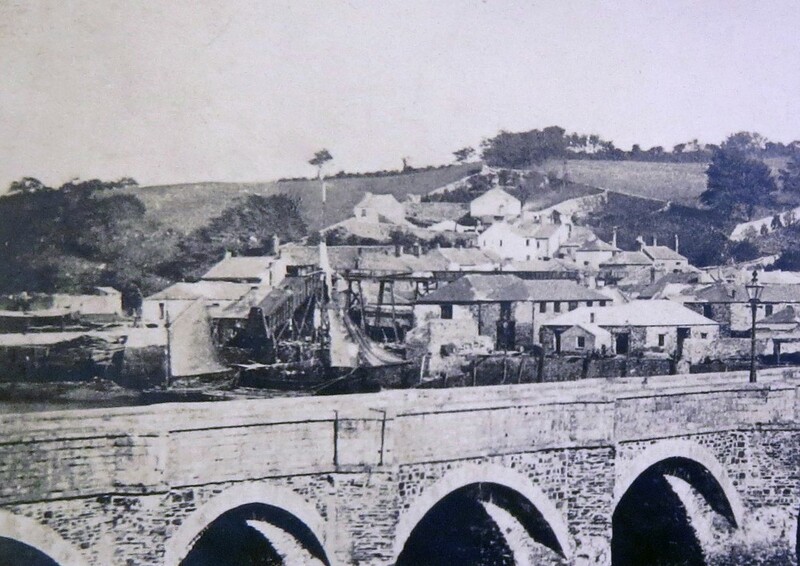 Prior to the outbreak of the first world war, the Tetty Boat often made the trip to Fremington for clay, navigating Fremington Pill as far as Muddlebridge, loading up to 30 tons, then shooting the Long Bridge to unload at Binney’s Slip, opposite Tanton’s Hotel. Another frequent run took her from the gravel banks in the estuary to New Kiln, at Annery Brickworks, Landcross. For pictures of Tetty Boat in operation, see Figs. 10 & 11 in Grant & Hughes. North Devon Barges. 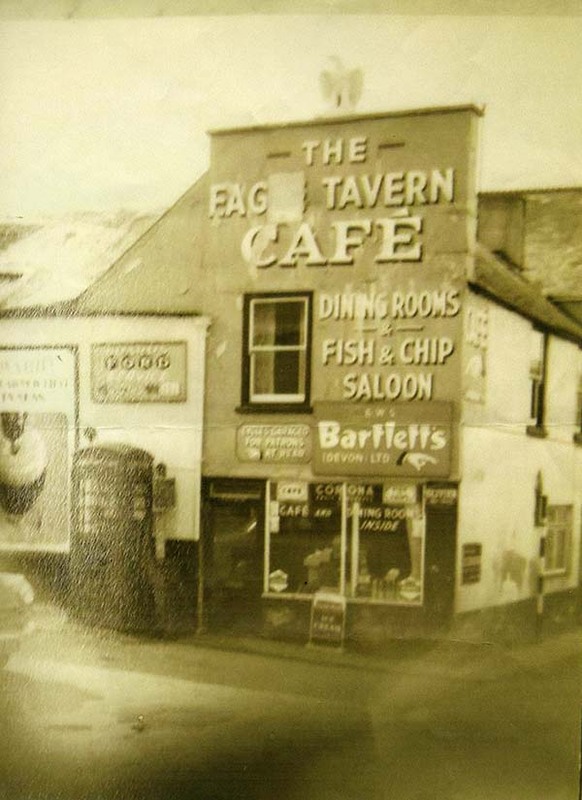 North Devon Museum Trust, 1975. On the wall behind the barge lies the licensed boat TIH33. 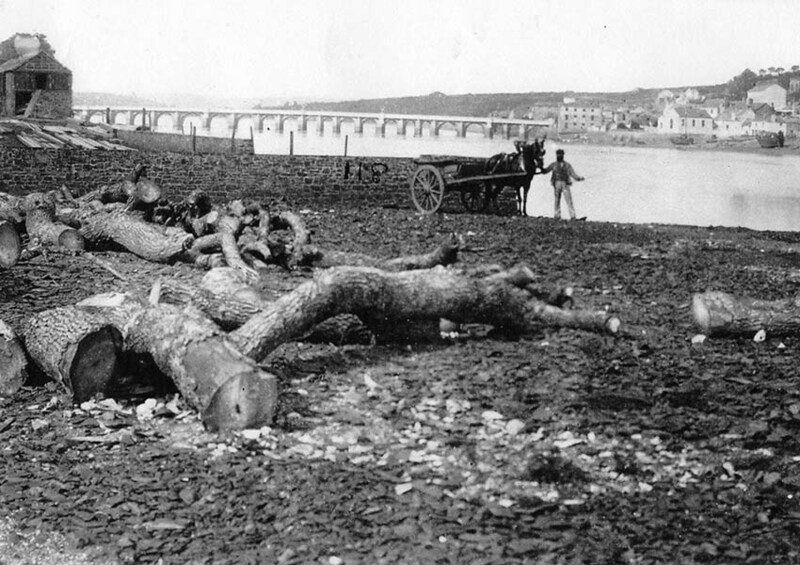 Barque at Clarence Wharf, c. 1863? 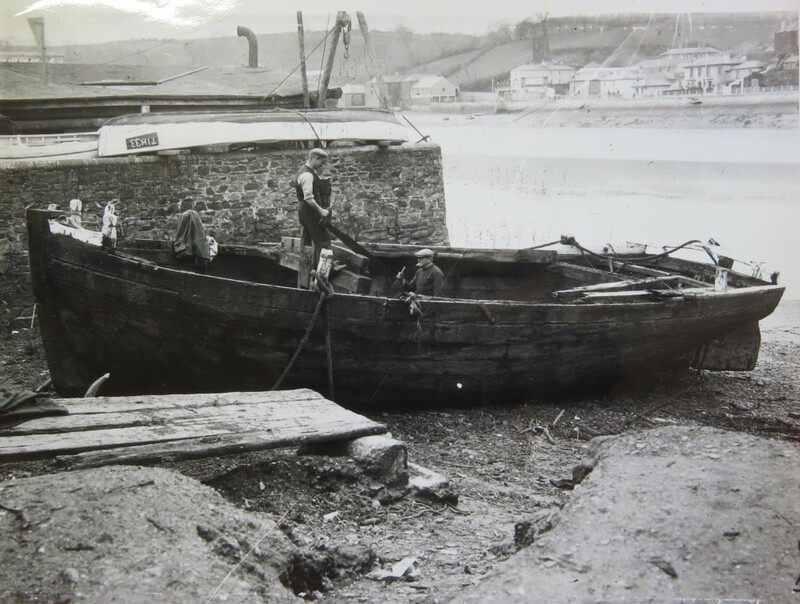 This barque is almost certainly loading anthracite, dug from the Bideford Anthracite Mining Co.'s mine in the hillside across the road. 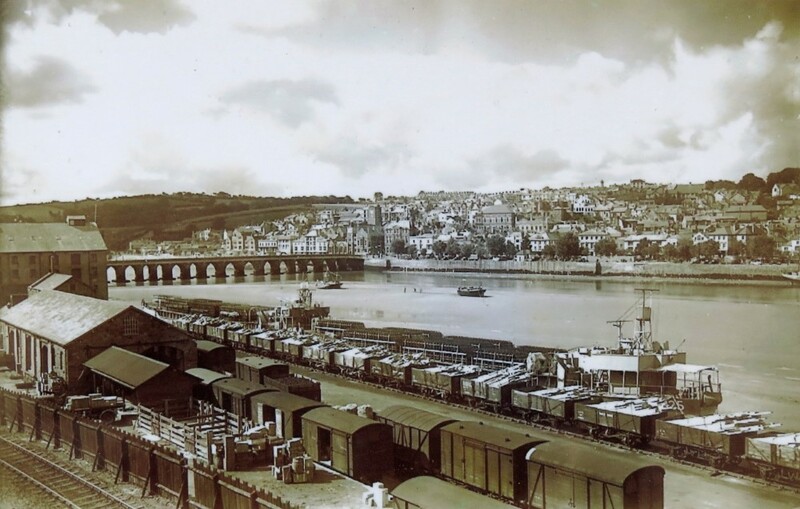 Having been loaded into trucks at the coalface, the trucks were transferred directly to the head of a gantry that carried them over the Barnstaple Road and Clarence Wharf. 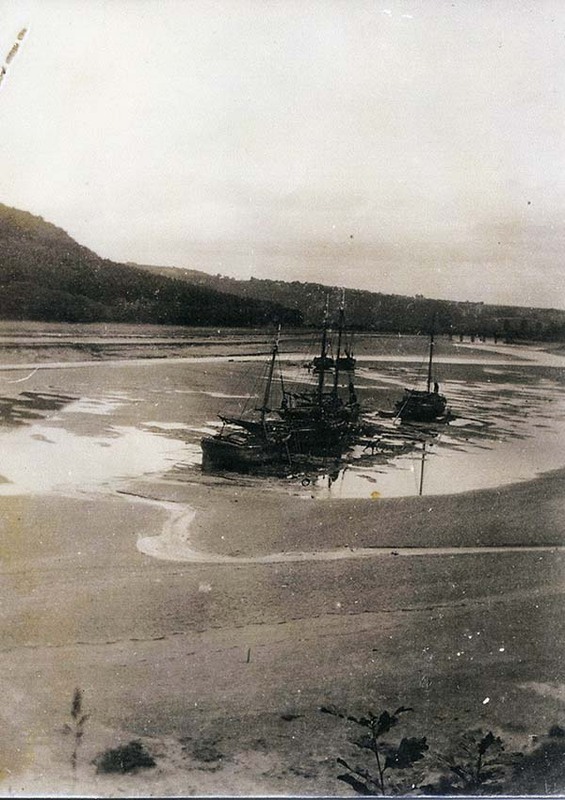 The anthracite was then tipped down a chute (seen amidships) into a waiting vessel. The power to drive this system came from an engine house, which can be seen on the hillside beyond (on the right). 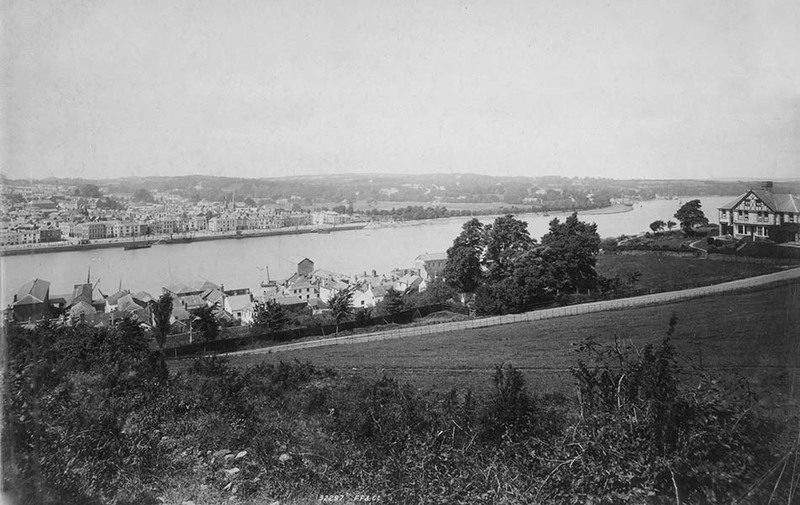 This mine worked the main anthracite seam, which ran eastward into the hillside for a considerable distance, but it also supplied Bideford Black, which came from different strata, somewhat further to the south. 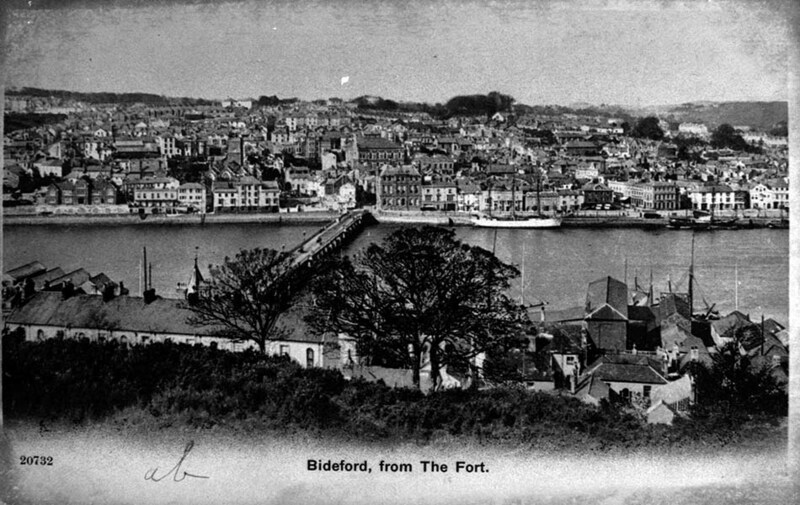 The Bideford Black was ground in a mill adjacent to the engine house to produce a valuable mineral pigment with a variety of uses. Our ref. 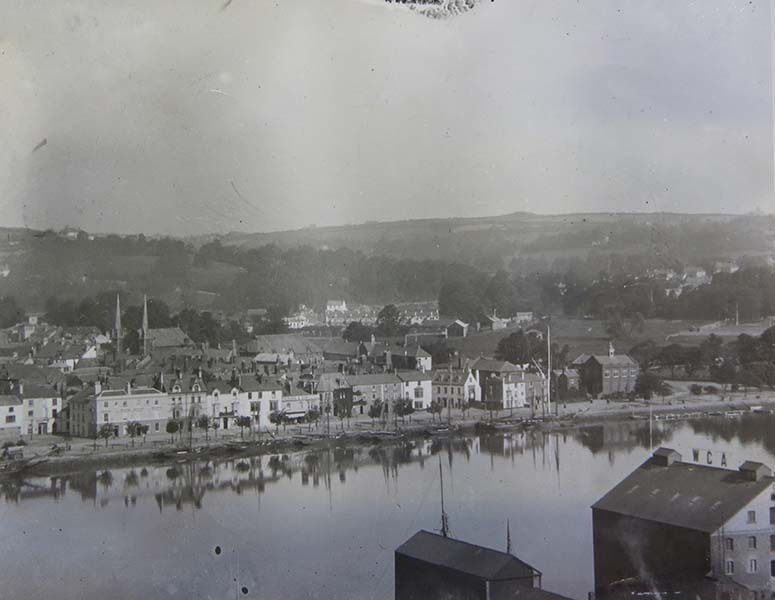 WOTW0001; Photographer Thomas Tedrake; from a physical copy held by Bideford Library; used courtesy of Bideford Library; published in Thomas Tedrake, Six Studies of Bideford, Bideford: c. 1863. Last updated 5 Jan 2019 by R. I. Kirby. 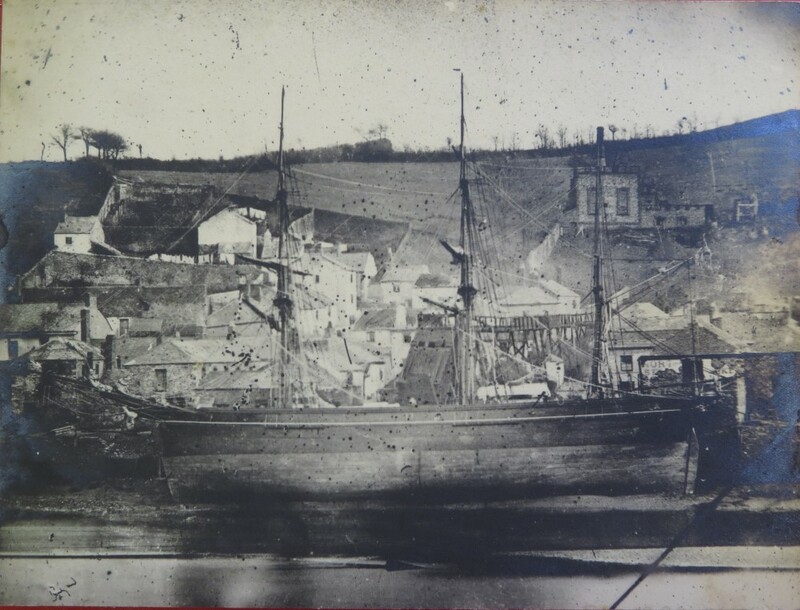 In 1879 Henry Morgan Restarik's shipyard launched the barquentine Winifred (tonnage 200g 192n), pictured here moored alongside the yard. 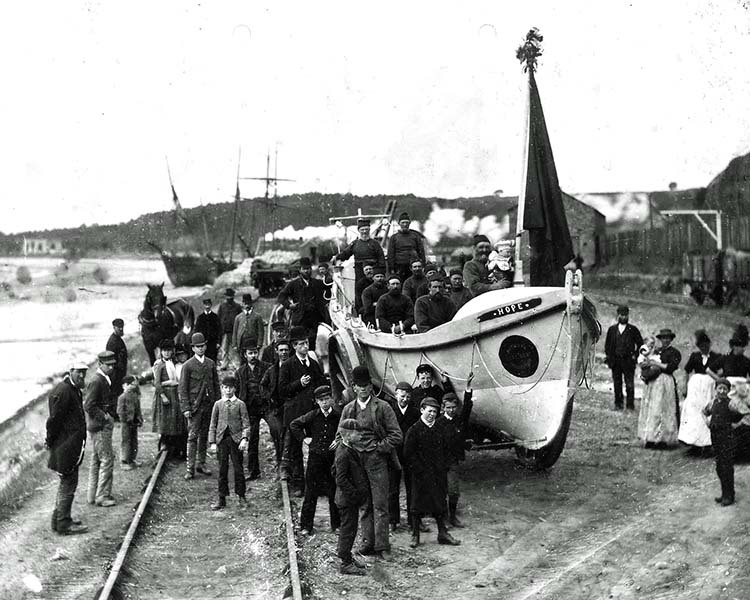 The Winifred appears to have left the North Devon area soon after her launch, as she was in Australian waters by March 1880. Two of the stores in this picture are advertising Fison’s Manures. 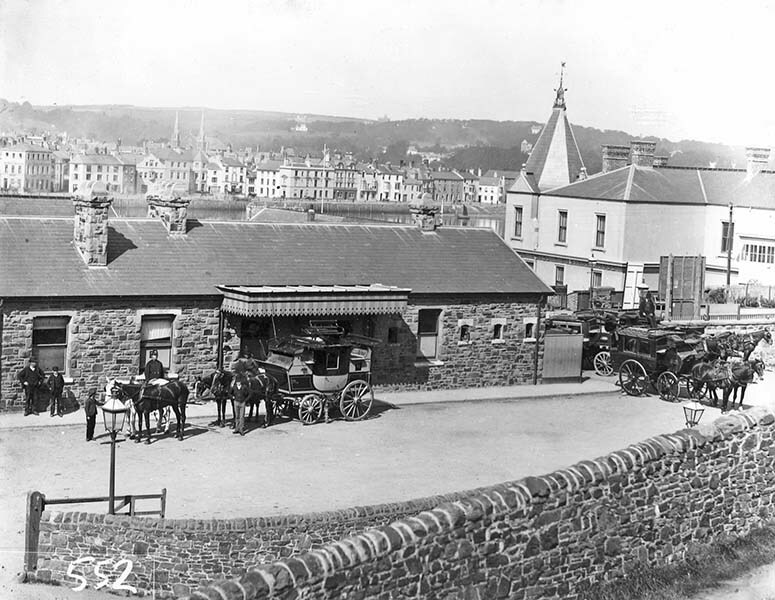 By 1877 Bideford had become one of that companies three principal western depots, the others being Plymouth and Poole. Our ref. 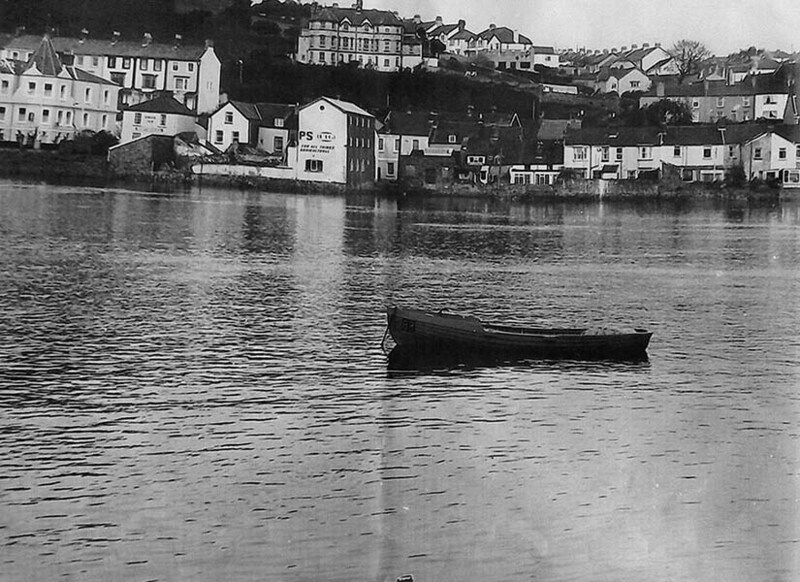 WOTW0002_AS1; Photographer unknown; © unknown; from a digital copy held by North Devon Maritime Museum, Appledore under ref. Johnsons Yard. A1.401; used courtesy of North Devon Museum Trust. Last updated 5 Jan 2019 by R. I. Kirby. 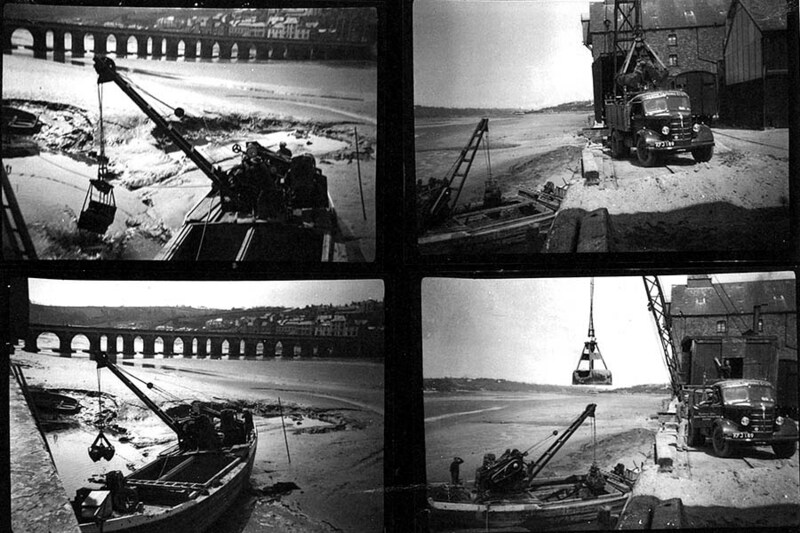 This picture, which has circulated widely, is often thought to depict the last launch from Restarick’s Shipyard, during which the vessel had collided with the bridge, none of which turns out to be true. 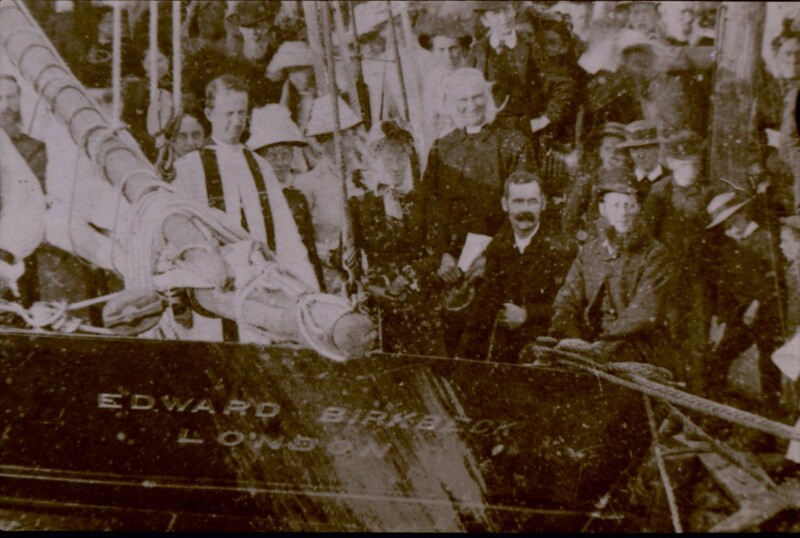 The ship, the Edward Birkbeck is being blessed, several days after it was launched, and Restarick’s last launch was of the Fair Fanny, a year later, in 1886, the year in which a popular history of Bideford places the collision, thanks to an undetected transcription error of 1886 for 1868. Incorrectly annotated copies in collections continue propagate these errors. 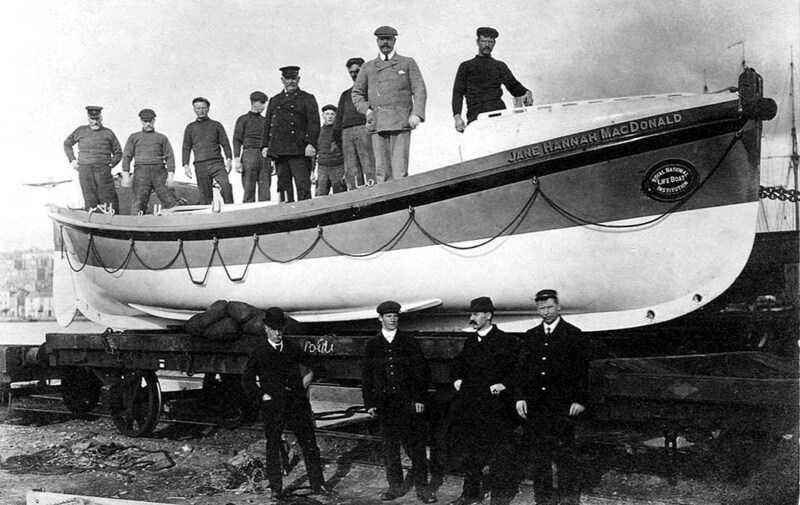 Built at a cost of £2,000 and launched on 12th August 1885, the 88 ton smack Edward Birkbeck was constructed at Henry Morgan Restarick’s yard, one of three such vessels that he built for the Royal National Mission to Deep Sea Fishermen in their early days. This photograph was taken a week after the launch, when she was blessed, by the Bishop of Exeter, in preparation for her life of service. 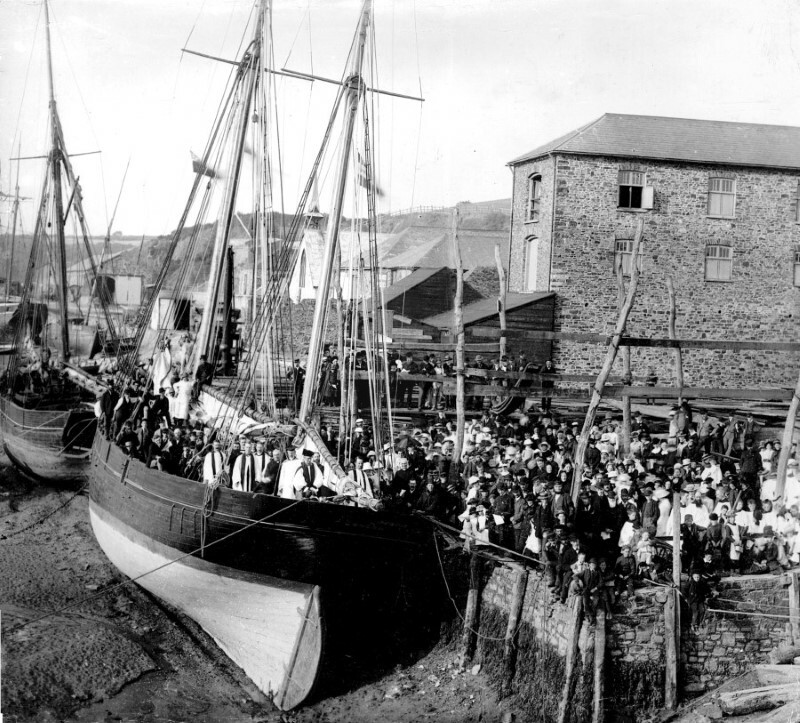 After this launch the yard would only complete another three vessels, with the last, the Fair Fanny, launching in 1886. On the left of this picture, from the period 1886-1891, is the light corrugated-iron roof of the Iron Church, on Clarence Wharf. This prefabricated house of worship, which seated 350, was erected to help cope with growing congregations elsewhere. Granted its faculty for performing divine service in 1880, it was used until 1890, when it was replaced by St Peter’s on Torrington Lane. 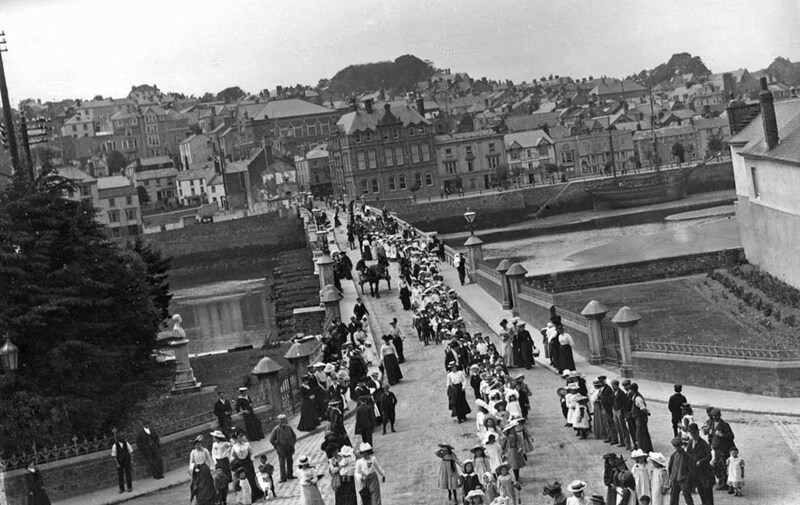 It is believed that the Iron Church was subsequently move to Ilfracombe to help cope with the summer crowds. 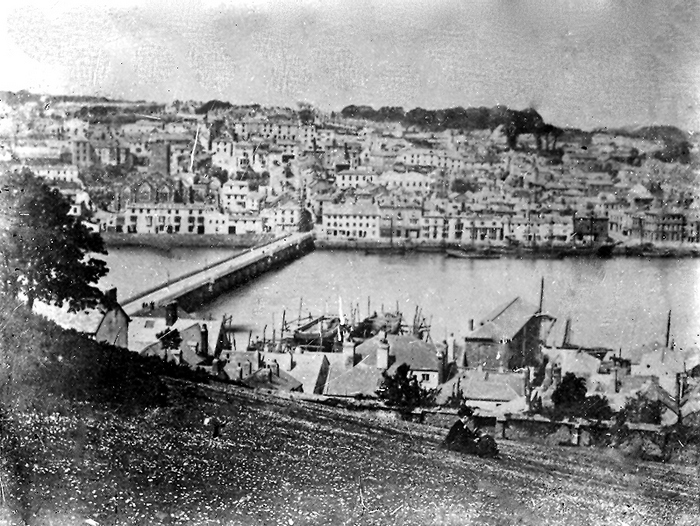 This early photograph shows both the stores on Queen’s Wharf before their 1867 extension and the area of shore (covered by the tide), upstream of Johnson’s shipyard, onto which the wharf opposite the Colonial Buildings would be extended in 1865, allowing Johnson to increase the capacity of his shipyard from two vessels to three. 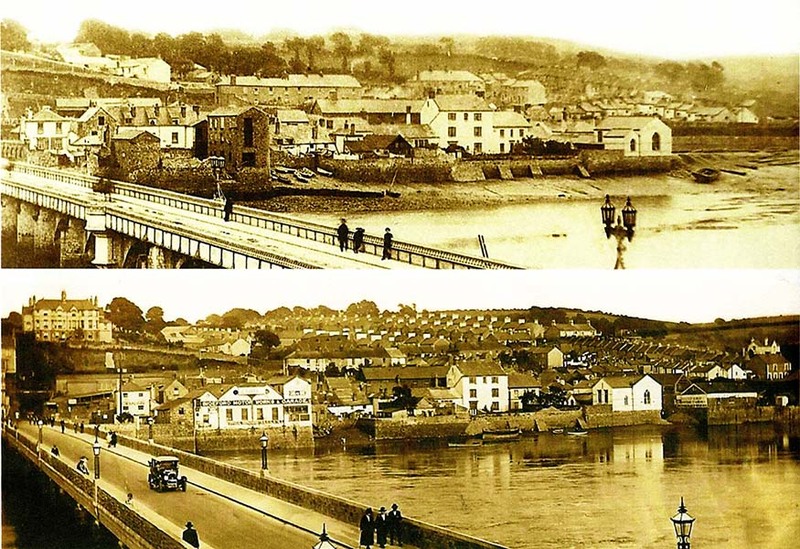 The bridge, however, has already undergone its 1864 widening. 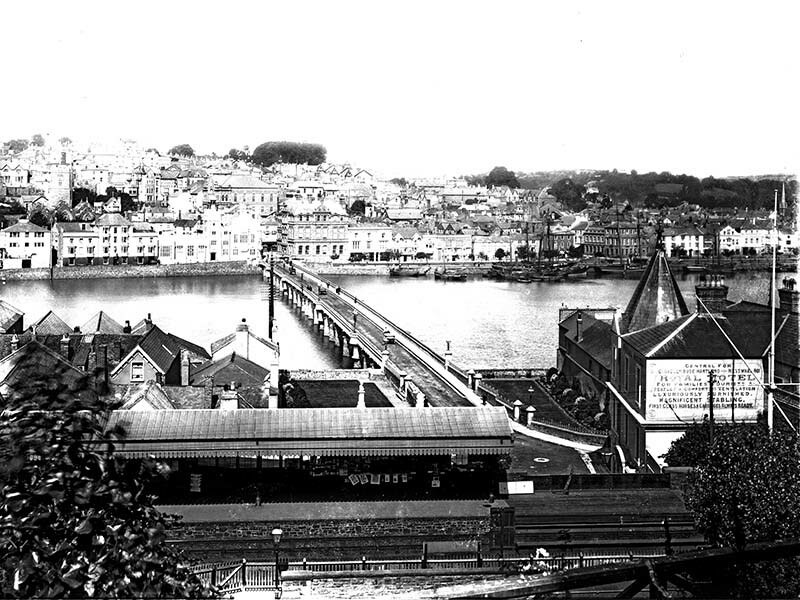 Note also the absence of Steamers Wharf, which begins to be referenced in the press around 1884. 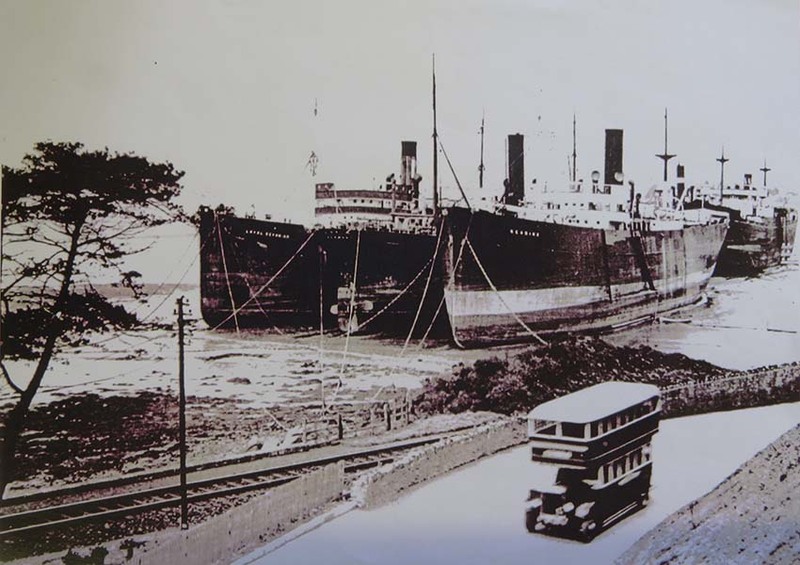 S.S. Overton off Clarence Wharf, 20th C.
The vessel on the left, the S.S. Overton, of Liverpool, appears queued for Devon Trading’s Clarence Wharf. 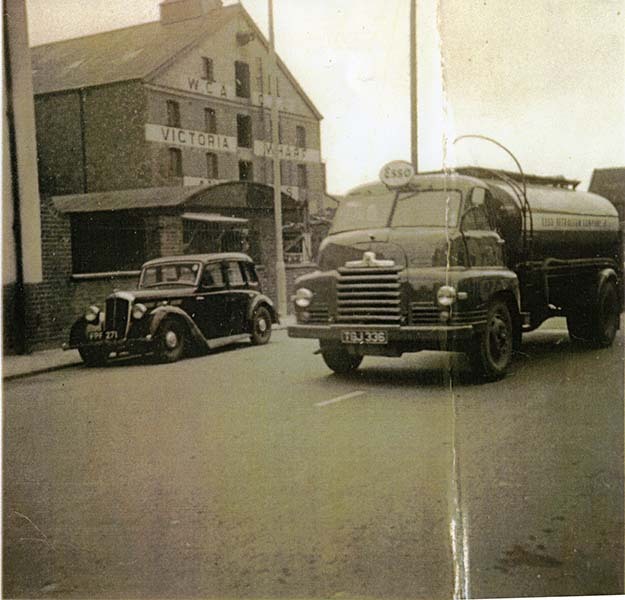 The picture, which dates from the period 1930-55, shows (rear to front) the Western Counties Agricultural Co. Op.’s mill, Devon Trading’s Clarence Wharf, Fulford’s stores, and Baker’s cement stores. 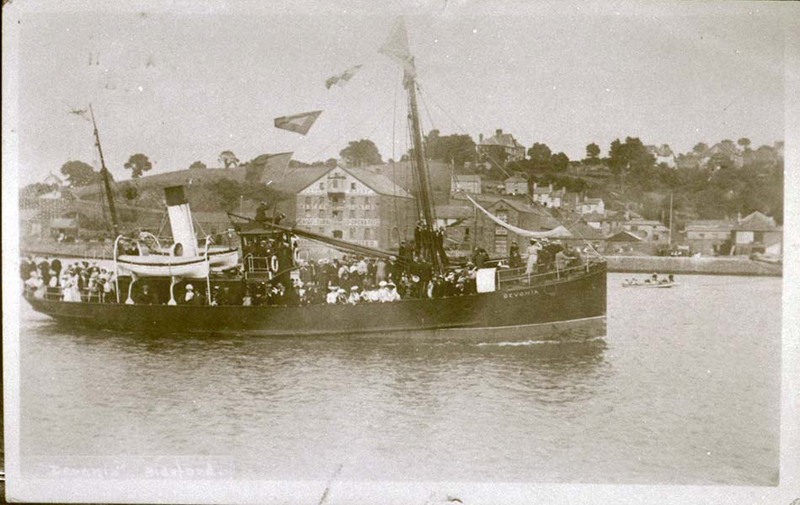 The sailing vessel in the foreground has not yet been identified. Taken in the period 1873-1880, when the widow of Capt. Hammett ran the big house to the left as a boarding house. In front of Hammett’s house is the southern end of Railway Wharf, as yet undeveloped. 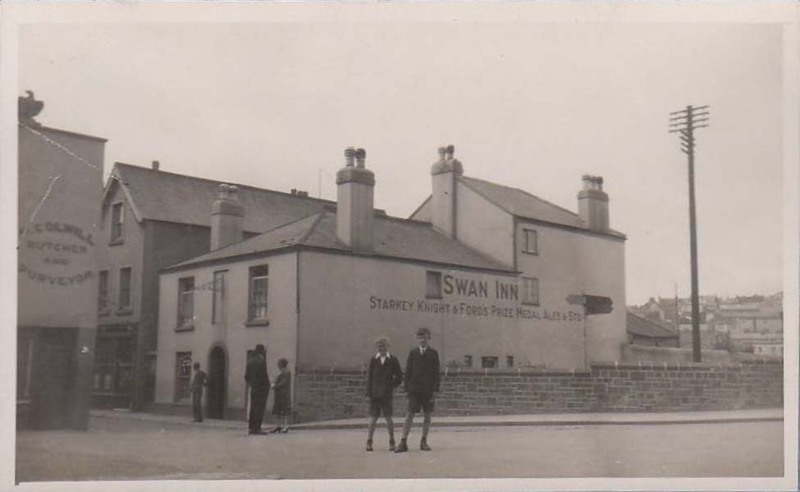 The distinctive building, with lower floor arches, was probably Mr. Philip Colwill’s stores, and lay opposite the Princess Royal Inn. Colwill is known to have dealt in agricultural produce, guano, lime, and timber. 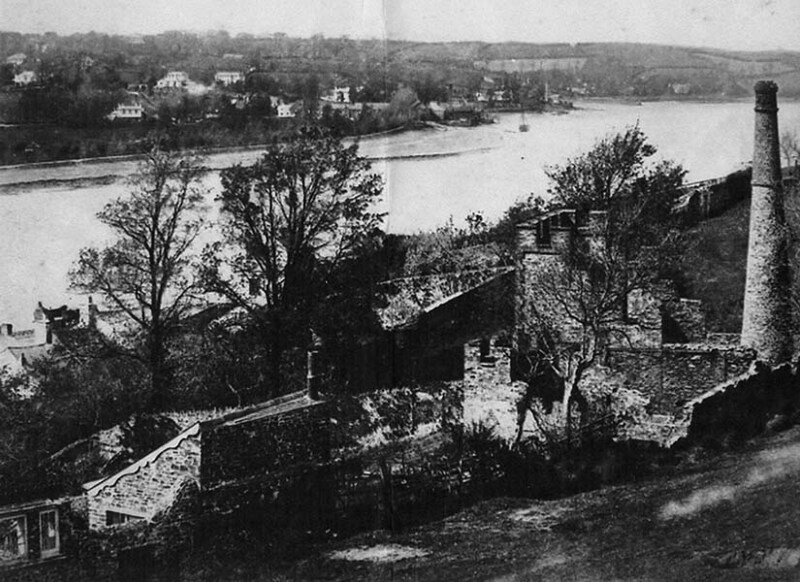 Garden of Torridge House, c. late 19th C.
This picture, from the period 1882-1904, shows the garden of Torridge House, the gardens of which are reported to have been laid out, by a Dutch gardener, about the time when William of Orange ascended to the throne (1689). The family in the picture are thought to be Mr Robert Barrow (on the right) and his son, Mr. James Barrow (holding the child). 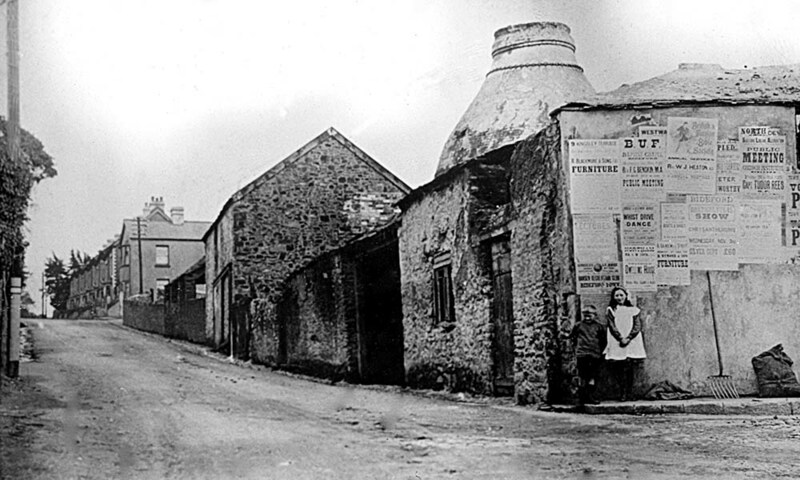 The Barrow family occupied Torridge House at this period, and their brewery, the biggest in Bideford, lay next-door to the south. The new Bridge House, built in 1882, dominates the far end of the bridge. 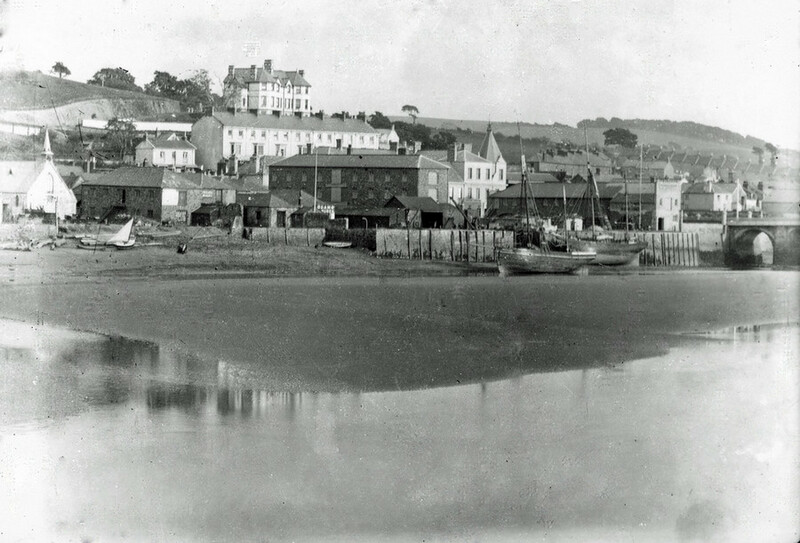 Taken between 1885 and 1891, this picture shows the Iron Church on the left, whilst the store to its right housed the Clarence Wharf home of Bideford Rowing Club. 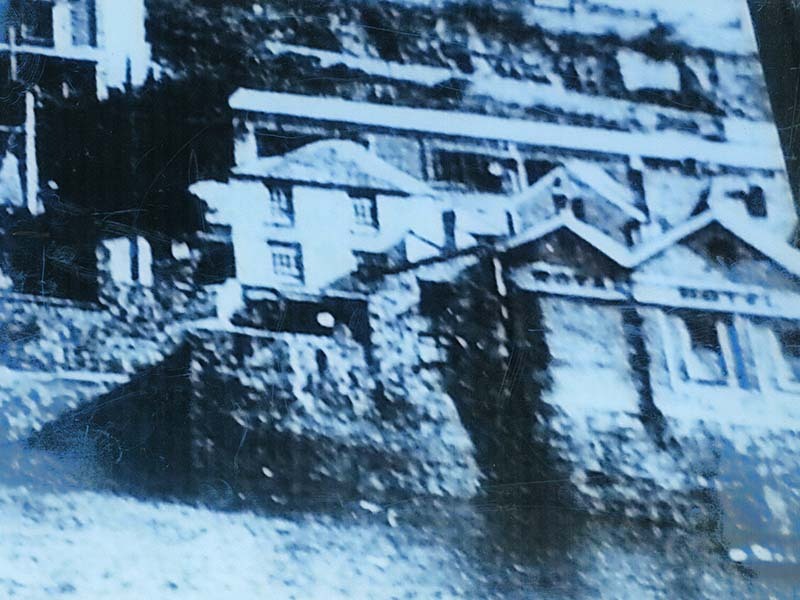 A small store, on what would become Steamer Wharf, bears the name Odams Manures, whilst the large store beyond it (in the centre) is on Queen’s Wharf. 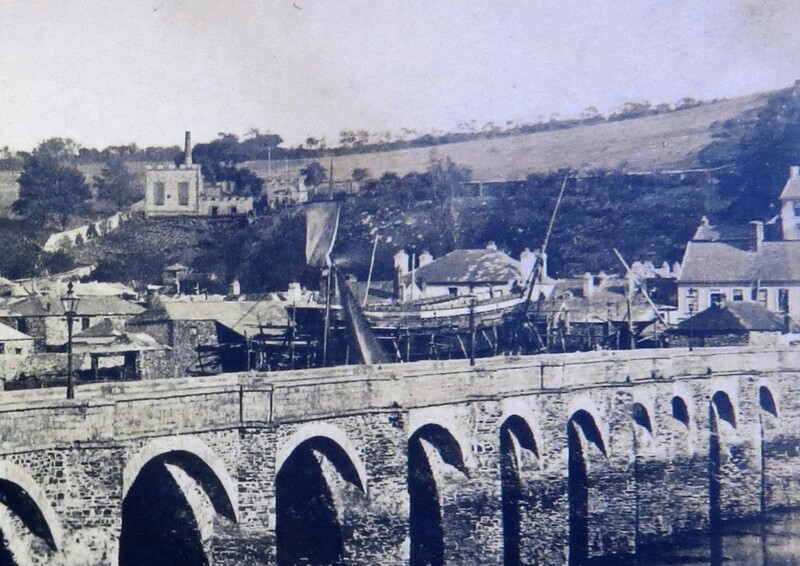 Clarence wharf has yet to be extended out, and the later Steamer Wharf store has yet to be constructed. 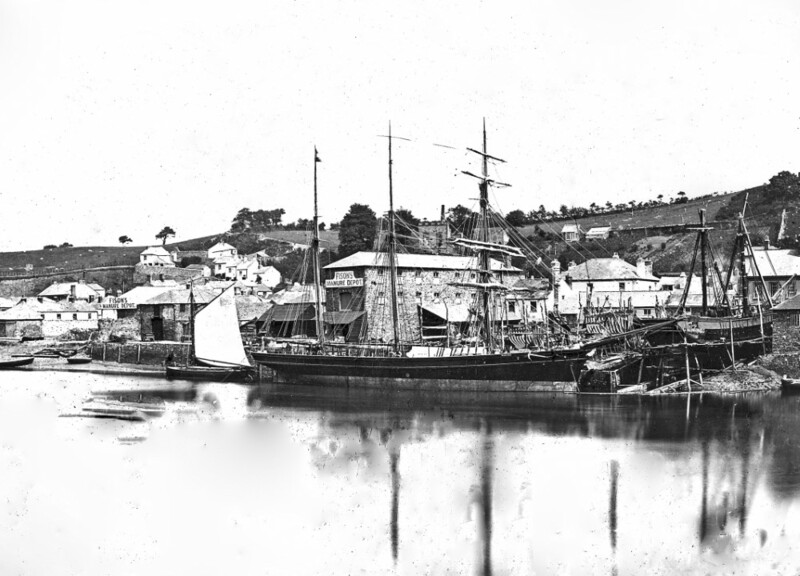 The schooner Ebenezer, of Padstow, sits beside Queen’s Wharf, rented at this time by the Devon Trading Company (prior to their move to Clarence Wharf). The building beyond the schooner is on Agricultural Wharf, whilst, just beyond it, the forest of poles are the scaffolding for the construction of Victoria Wharf and the W.C.A. 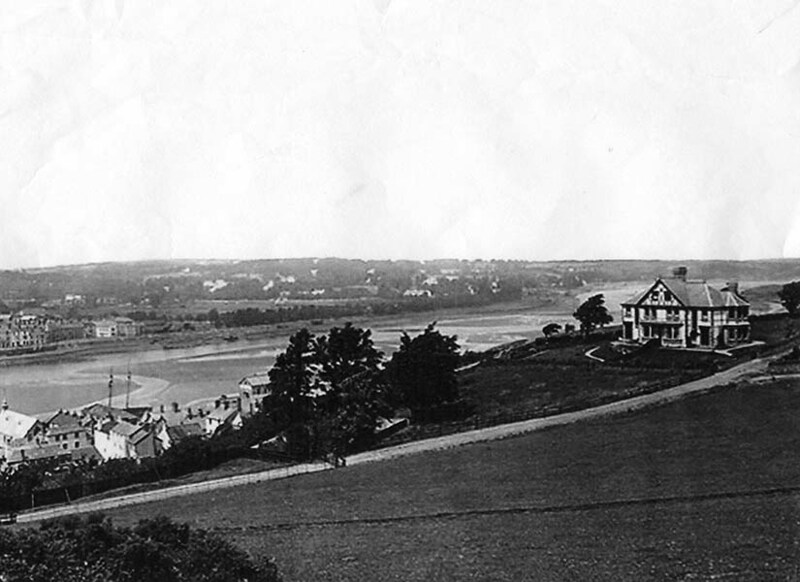 Co. Op.’s mill, dating this picture to 1893.